Wharfedale came away with two points but rueing what might have been. A stuttering first half display by the visitors saw Hinckley go in at half time leading 21-15. Wharfedale tightened up the defence after the interval and some superb play saw them stretch away with 15 unanswered points. Heartbreak was to follow. Dale seemed to have weathered the storm as Hinckley desperately attacked and Dale won a defensive scrum. The ref then penalised Phil Woodhead for not getting the ball in quickly enough. With two minutes to go Hinckley opted for a scrum and pushed Dale back and Glover touched down and then converted. Two phases later Hinckley were awarded a penalty and Glover, with the last kick of the game, won the match with an accurate kick. Josh Prell then scored for Dale when Tom Davidson turned the ball over and set off in attack. He fed Prell who rounded his opposite number and beat the cover to score. Jamie Guy just missed from the tee. The restart showed the importance of an exit strategy. After one phase Dale kicked downfield and good follow up led to a Tom Davidson tackle and others joining in to successfully hold the player up and get the put in at the scrum. After exchanging kicks Dale again found themselves in defence but again no real exit lead to a mistake and an attacking Hinckley scrum. A penalty was awarded but not taken as Hinckley used the free ball to create space in midfield for Alex Crocker to dance through for a simple but well executed five points. Glover sent the ball through the uprights again. It was Hinckley’s turn to mess up the restart as they knocked on. Dale then won a scrum penalty and went for the corner. Good pressure only led to an easy penalty chance for Jamie Guy and the three points were taken. Could Dale get the exit right this time? No. They heaped more pressure on themselves when having taken the restart they took the ball out of the 22, the touch kick then went straight out and Hinckley were handed another attacking platform. They used the chance efficiently and exerted intense pressure on the Dale defence. Eventually space was worked in midfield for Alex Murray to have a clear run for the line and Glover stretched the lead to 21-8 with a third conversion. Wharfedale finished the first half strongly. A thirty metre catch and drive nearly led to a score but the ball was spun wide and dropped. Hinckley did threaten briefly when they intercepted a pass from Phil Woodhead but the cover was strong enough and Hinckley messed up a fairly good chance. Exit strategy again showed the sense of simple play. From a scrum in Dale’s 22 the clearance kick was sent high downfield. Good following up again forced a turnover and the Dale attack only ended by being forced into touch. Hinckley won the line out but a strong tackle from Alistair Allen sent the ball loose, Tom Whyte hacked on and set off after the ball. Whyte was pulled down before reaching the ball but Dan Stockdale was on hand to touch down for a try. Guy’s two points brought Dale right back into the game at 21-15 with the bonus that Glen Murray, who had brought down Tom Whyte, was rewarded with a yellow card. Dale exploded at the start of the second half. A good line out was followed by fine handling in the backline and a defence eluding run from Scott Jordan for a score that with Guy’s extras took Dale into the lead. Hinckley found the Dale defence now in stubborn mood and were finding it difficult to get any field position. Dale were now running with strength and conviction and another successful penalty from Jamie Guy was their reward. With 11 minutes to go Robbie Davidson ran a superb line through the middle of the Hinckley defence and Scott Jordan was on hand to grab his second try of the afternoon. 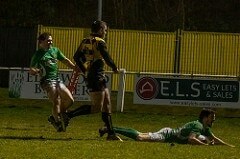 Jamie Guy could not repeat his accuracy from the Otley match and the touch line conversion was missed. Surely a five point win was secure. Then the agony. But at least some good rugby played, the respect earned and two priceless away points to start 2017. Congratulations to Josh Prell on a successful return to 1st team duties and a paper hat trick. The Rugby Paper was fed the news by the Hinckley reporter that Josh had scored three tries and seemed to ignore any of the dazzling footwork from Scott Jordan. Tom Davidson had a very strong game and was responsible, on more than one occasion, for turning the ball over and setting up attacks. His game included a burst of speed that one of his brothers would have been proud of. Robbie Davidson and the Bullough brothers also played well and made good contributions in defence and attack. The Hinckley coaching staff had done their homework and gave Phil Woodhead and Jamie Guy little time or space to work their magic. Both played well but could not match the way that they destroyed Otley before Christmas. The pack, apart from the scrum, was a match for the Hinckley eight and won the battle of the breakdown and dominated the line out with accurate throwing from Dan Stockdale and Ian Larkin. All jumpers were outstanding and Richard Rhodes showed that he is getting stronger with every game played. All the forwards made some big tackles and carried the ball with enthusiasm. If we can replicate this form at home, learn the lessons and remember the game plan, then we can enjoy a good win next week against Tynedale. The support for Dale was good and at times seemed to vocally match the home support. The crowd support against Otley helped raise the game of the players. Let us hope that the same support will be there next week. Wharfedale: – Scott Jordan; Robbie Davidson, Harry Bullough, Tom Davidson (Jimmy Bullough 45), Josh Prell; Jamie Guy, Phil Woodhead; Joe Altham, Dan Stockdale (James Huck 55), Toms Asejevs (Ian Larkin 50), Richard Rhodes, Alistair Allen (Adam Howard 55), George Hedgley, Tom Whyte (Matt Hall 60), Josh Burridge (c).